Low Brow Show — Another New Gallery in Ajo! 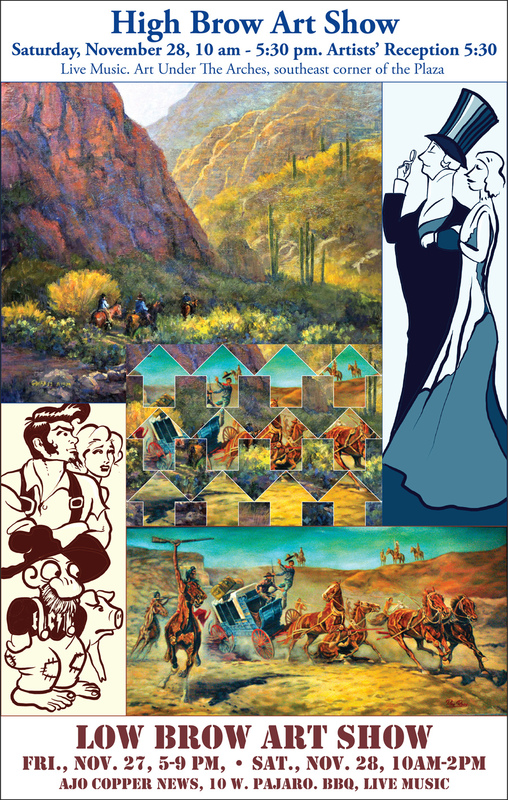 The Low Brow Art Show is taking place Friday Nov. 27 from 5 pm to 9 pm and Saturday, Nov. 28 from 10 am to 2 pm at the new gallery located in the Ajo Copper News. “Mike Baker and I have always rankled at the boundary some place between fine art and commercial art,” says Hop David, well-known artist and editor of the Ajo Copper News. “For example, artists like Norman Rockwell or Maxfield Parish were looked on with disdain. Some critics would label them illustrators and not fine artists. “The renaissance artists are regarded as the pinnacle of fine art. We like to point out that these guys were working stiffs carrying out their job assignments from bishops, princes or other patrons. “In the Low Brow Show we’re hoping to stretch the boundaries of what people regard as art. A lot of ‘red neck’ or blue collar folks work very hard in their craft and consequently produce worthwhile work. “We believe all the artists we’re showcasing are fine artists regardless how some may label them. “Those interested in participating please send me images of your work and/or stop by the Copper News office and show me. “We are also encouraging people to set up tables in the Copper News parking lot. There’s 18 spaces, as of this writing five people have reserved spaces. As often happens in this town, folks share the stage — so you get a double scoop of art this weekend. The Low Brow Show opens Friday night and the High Brow Show opens Saturday. Ajo Street Art Project — It’s Happening! Ajo’s first Community Arts Gathering starts this Friday evening with a potluck to welcome visiting artists and give them an opportunity to meet their Ajo counterparts. It’s gonna be great to see so many new faces. One of the most visible and exciting parts of the Gathering will be the Street Art Happening. Mike (DaWolf) Baker kicked off the event earlier this month when he completed his latest mural right along Highway 85. Since then he’s been over-seeing the preparations for both local and visiting artists who’ll be contributing their work to once-dingy walls that line the alley between the Plaza and the old warehouse. I stopped by for a look this afternoon and found one artist from Alaska working on her mural. Several designs have already been added to the walls and more are on the way. Artists will be painting here for the next week. They may be working at all hours, maybe even at night, so chances are good you’ll have a chance to see great art in the making! It’s about borders. Hop David. Mike (DaWolf) Baker finished his mural a few days ago and what an eye-catcher it is. You can check out the beginning stages of this work in an earlier post. This piece is just the first of many that will begin to appear on the surrounding walls of the alley behind the Plaza and the adjoining warehouse in the coming weeks — the Street Art Happening is part of the Community Arts Gathering March 14 to 18. It’s going to be wonderful time — we hope you can join us!